Starts with Leia telling Luke he should just run away, and ends with Han asking what's going on (twice). Leia's line sounds like song lyrics. Shout out: Lawrence Kasdan. The writing was split between Kasdan and Lucas. Which lines were Lucas'. Mentioned: Pete hates the Prequels. Luke being the only hope for the Rebellion. Leia is ok with telling him to run away. Paul had the Ewok Village playset. He enjoyed taking the railings off and chewing on them. Teeth marks on action figures. The quality of the acting/directing/script. ROTJ toys recycled as Robin Hood: Prince of Thieves toys. When your planet blows up, it's like international waters - there's no rules! The "good side" of the Force. The notion that you can turn someone back to the Light is new and individual to Luke. Paul grew up believing that Yoda was human, but just really really old. What if Luke had succeeded in turning Vader? Vader slipping up and choking people. Mentioned: Pete's theory that Luke and Leia aren't siblings. John Williams is great. Repeating themes in different emotional contexts. Referenced: The Brady Bunch, Gilligan's Island. Han overhearing Luke free Leia's conversation. They could have played up the misunderstanding for comedy, á la "Three's Company". Or the trope where Mark Hamill is playing two different characters in the movie. Referenced: Ben Cooper Star Wars "costumes", Lando stealing Han's wardrobe. Having matte paintings on your own (or your uncle's) basement wall. Cold open: Today’s episode is sponsored by Dodd Skalle Investigations Vol. 1: The Simian Case! Robin Hood: Prince of Thieves came out in 1991. "Gamorrean Tuck" was brought up previously, in minute 35. 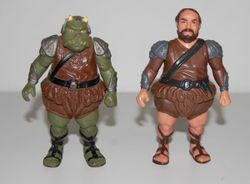 The Gamorrean guard/Friar Tuck action figure may have not had an inappropriate corkscrew under his outfit, but some ducks actually do1. Pete: This is like the McDonald's of the Ewok village. Alex: I just want to chew on a normal size railing, is that so much to ask?! Pete: Somebody's been hitting the blue milk.